Identify the number of the row in Autotrader for purposes of creating formulas that reference that row. View the status of a contract as it trades. Enable a row. When enabled, you can interact with a row's fields and Autotrader can trade the displayed contract normally. Disable a row. When disabled, the row is grayed out, Autotrader does not trade it, and you cannot interact with its fields. Assigns sequential numbers to your rows. : Your status is normal. Used in Auto Mode. : Your status is normal. Used in Manual Mode. : Your order needs to be updated. Used in Manual Mode. : There is a problem (e.g., you reached your maximum position, or no market exists). Used in both Manual and Auto modes. : The throttling settings prevented Autotrader from updating an order that otherwise would have been updated. Possible problems or errors exist. Used in both Manual and Auto modes. For more information, double-click the Status cell for a description. Sets whether you can use Autotrader to trade the row's contract. To make the contract tradable, click to select Active. To disable the row, click the Active cell. Once disabled, Autotrader cannot trade the contract and deletes all of its orders in the market. You can continue to interact with the contract's trading parameters. Displays the contract assigned to the row. Broker Displays a drop-down menu of available brokers for the contract row in a X_TRADER ASP environment. A broker must be selected in order to trade the contract. The TT Gateway that the broker is connected to is also displayed. Order GW Displays the logged in TT Gateways for the exchange contract in the row, or displays either "Desktop" or the specific ASE server that was selected when an Autospreader spread was added to the row. This column is available only in a non-X_TRADER ASP environment. Note: When more than one Gateway flavor exists for a contract (e.g., CME-A, CME-B, etc.) new orders cannot be submitted until an OrderGW is selected. Status for the row will be red with the status text message: "OrderGW is not selected for the row." Select automatic or manual trading. Select the Profile that contains the trading parameters you want Autotrader to use. Select the Account Name under which you want to trade. Monitor the number of transactions that Autotrader has performed. Shows the row names to clarify their use. By default, this field is hidden. Note: You can assign the same name to multiple rows. Limits the row's contract to manual trading. When you select this option, Autotrader does not automatically quote the contract. Sets the row's contract for automatic trading. Autotrader quotes the contract according to the trading parameters you set up on the Profile Setup Page Overview. You select the particular profile in the Profile field. Sets the name of the profile you use while trading the contract. Account Sets the Account Name associated with the trading of this particular contract. The Account that is selected must match the Order GW designated Broker Account that was setup in Customer Defaults. If the Account cannot be applied to the contract on the row, the value of this field defaults to the Account Name you set up in the selected Profile. Displays the number of transactions (deletes, adds, and changes) accumulated while trading the contract for that particular row. You can monitor the total transactions for your row to help avoid exchange fees attributed when exceeding your maximum. Note: If you trade the same contract in another X_TRADER module (e.g. MD Trader), its transactions are not included in this field. Use the Open/Close section to identify whether or not you are initiating a position or closing an existing position. The Open/Close column is initially disabled. Options orders require the open/close designation. If you send in a sell order with an O designation, short sale rules apply and you cannot sell on a downtick. If you send in a sell order with a C designation, you are closing out a long position and your sell order can be filled on a downtick. Right-click in the grid to display the context menu. Click Hide/Show Cols to display the Show/Hide dialog box. Scroll down to the end of the list. Click Open/Close to display a checkmark in the box. The grid displays the Open/Close column. You successfully viewed this column in Autotrader. Note: Because the values of these fields depend on your trading activity, you cannot edit these fields. Displays your current net position. Net position is the sum of all positions for a particular Group ID Number across all contracts. Displays the position for each contract by account. If multiple rows contain the same contract and Group ID Number, Autotrader displays the same OpenPos for each row. Note: This column displays all quantities traded since you launched X_TRADER. In the Using the Control Bar. You cannot hedge your position using the Control Bar in theOrder Block window. In the Managing Your Position accessed through the context menu of Autotrader. Hedging a contract reduces the value in that particular row's OpenPos. By default, ResetPos is hidden. Displays the average buy or sell price for the current position. Average prices are displayed as decimals. Displays the last fill price of an Autotrader order working in that row. Example: An Autotrader order with a quantity of 10, working at a price of 105.60, is partially filled with 5 lots. The LFP field displays 105.60. If the order reprices to 105.50 with a quantity of 10 and completely fills at 105.50, the LFP field displays 105.50. This field lets you incorporate the LFP in one Autotrader strategy into the strategy of another Autotrader row. Displays your open position for orders traded using the Autotrader strategy in that row. Open a Floating Order Entry window for a contract. Market Ask columns: Background default color is yellow; text default color is red. Market Bid columns: Background default color is yellow; text default color is blue. Note: Because the values of these fields depend upon current market conditions, you cannot edit them. Displays the quantity of the current market's best bid. Displays the price of the current market's best bid. Displays the price of the current market's best ask. Displays the quantity of the current market's best ask. Displays the last traded price of the contract. Displays the last traded quantity of the contract. Displays the difference between the last traded price and the previous trading day's settlement price. Monitor your current bids and offers for that particular row. Working Ask columns: Background default color is white; text default color is red. Working Bid columns: Background default color is white; text default color is blue. Note: Because these fields only display your working orders, you cannot edit them. Displays the quantity of your working bid. Displays the price on your working bid. Displays the price of your working offer. Displays the quantity of your working offer. Also referred to as the Scratch Pad, the Scratch section displays current bids and asks calculated by Autotrader according to your assigned profile. If you selected Direct Order Entry as your Profile Base Price, the Scratch section displays bid and ask prices and quantities from Excel links or formulas entered directly into it. If you select Market, Single Theo, or Bid/Ask Theo as your Profile Base Price, the Scratch section is read only. You cannot interact with it and it only displays the current bids and asks.
. The values in Excel seed the Scratch section. Note: Each of the three types of trading listed above (Manual, Excel links, and Program) requires a different procedure for configuring the fields listed in the table below. Sets the quantity of your scratch bid. Sets the price on your scratch bid. Sets the price of your scratch offer. Sets the quantity of your scratch offer. Use the Profile Parameters section to display your current profile settings. Autotrader uses the settings in this section to determine how it trades. See the to set them. See Saving a Workspace to save your changes. Note: Your changes are lost if you delete the row or switch the row's assigned profile. Click Reset Default Profile Values from the Using the Autotrader Context Menu to revert to your originally configured Profile Parameters. Set and edit your cover order offset. Enable or disable the cover order offset. When selected, Autotrader automatically places offset covering orders for that row's contract when you receive a fill on a quote submitted by Autotrader. Use the Updates section to enable the Update Method feature. From this section you can change the Update Method set on the Profile Setup Page. Use Cancel/Replace: deletes your quote order and sends a new order to the market. A single theoretical price to use as a base when placing bids and offers. A theoretical bid and ask to use as bases when placing bids and offers. Theoreticals to help you make better informed trades. to a theoretical generator that uses the OLE standard (e.g., Excel). Note: You cannot use formulas in Order Block to generate Theoretical prices (although you can create a link to a theoretical generator). After you set up the theoretical fields, you can create a profile that uses theoretical prices as the Profile Base Price for determining your bids and offers. Links to your theoretical price generator. Links to your theoretical Bid generator. Links to your theoretical Ask generator. Links to your Delta generator. Autotrader uses this field for option trading. Links to your Gamma generator. Autotrader uses this field for option trading. Links to your ImpVol generator. Autotrader uses this field for option trading. Links to your Vega generator. Autotrader uses this field for option trading. Links to your Theta generator. Autotrader uses this field for option trading. Note: Delta, Gamma, ImpVol, Vega, and Theta are values used in options trading. Autotrader provides columns to display these theoreticals, but does not provide pricing models for their automatic generation. Instead, you must import these values from your theoretical price generator or Excel spreadsheet. Note: You cannot use formulas in Order Block. Scroll to the far right of the window. Click the cell in a Formula column for the row in which you want to use a formula. For the first formula, use the Formula A column; for the second formula, use the Formula B column; etc. 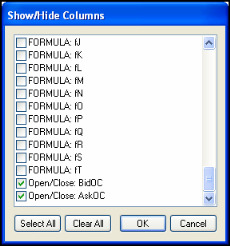 If you use more than two formulas, you must show the columns using the Show/Hide dialog box. Enter the you want to store. When entering your formula, you can reference specific cells in this row or other rows. If you want to reference a cell in another row, either use the row number or the RowName in the appropriate section of the formula. Both of these columns are hidden be default, and you must use Show/Hide dialog box to show them. If you want to use this formula in the future, save your workspace. You successfully entered a formula into the formula section. Click the letter in the Formula section that you want to rename. In the space between the Control Bar and the grid, type the name you want to give to the column. You successfully renamed a formula column.